The Dueler H/T D684 is a Highway All-Season light truck tyre designed for sport utility vehicles driven primarily on the road. It was developed to provide aggressive looks and year round traction, even in light snow. 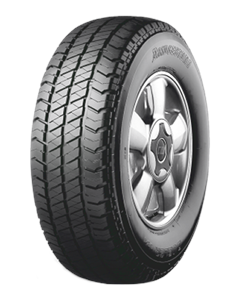 On the outside, the Dueler H/T D684 features a symmetric independent block tread design. Its tread blocks and all-season tread compound were developed to provide traction on dry, wet and light snow-covered roads. Internally, the Dueler H/T D684 features twin steel to stabilize the tread area and a polyester cord body to help cushion the ride.